Morocco embodies numerous contradictions and challenges for the national and international human rights community. Since the Moroccan Spring in 2011, women’s rights and civil society activists have been key indicators of the well-being of the State and of society. 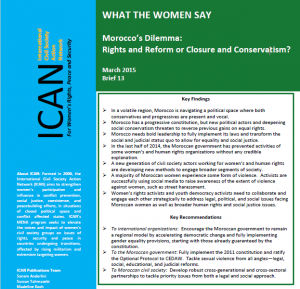 This brief outlines the current political tensions in Morocco and priority issues among women in civil society. It offers a brief overview of progress on Moroccan women’s rights and points to promising new initiatives by civil society to sustain progress towards greater equality and reform.